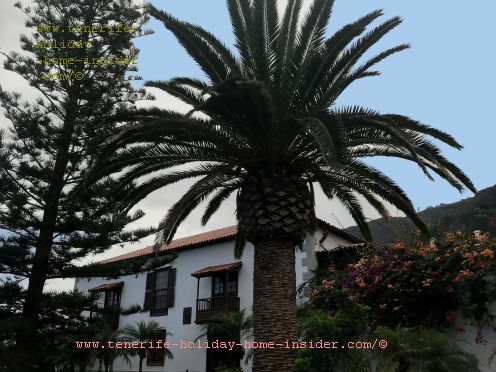 Nowadays, Garachico Tenerife is best represented by its globally unique and unforgettable Caleton. See it as a consolation gift after the volcano Trevejo's merciless actions in the first week of May 1706. 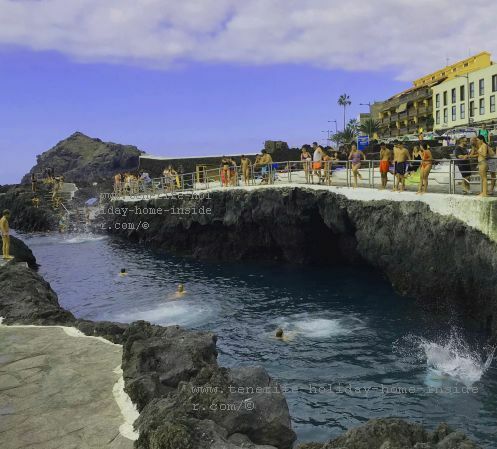 The Caleton rock pools were a volcanic creation. News: Rockpools of the Caleton are off limits often in Spring, such as seen on the 26th of March 2019 due to unpredictable dangerous ocean waves. 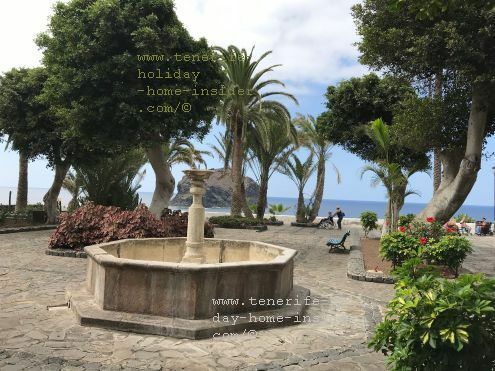 Now, this happens with all Charcas and similar pools and ocean ponds all over Tenerife, as its government puts immense importance to people`s safety. 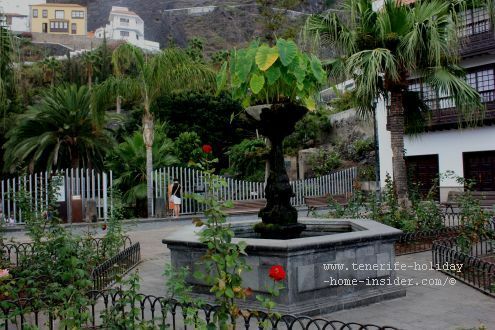 The destruction by burning Lava of the leading harbor of Tenerife the Puerto de Garachico was fatal and, not possible to replace, while the Caleton the priceless tourist attraction was only a somber eyesore at the time. Northwest panorama of La Villa de Garachico as far as La Montaña de Taco of Buenavista del Norte in the far back by the Atlantic Ocean. Iglesia de Santa Ana is in the center and the atrium of the Ex-Convento San Francisco de Asis is in the foreground. Burned down buildings and townsquares could be reconstructed and restored. 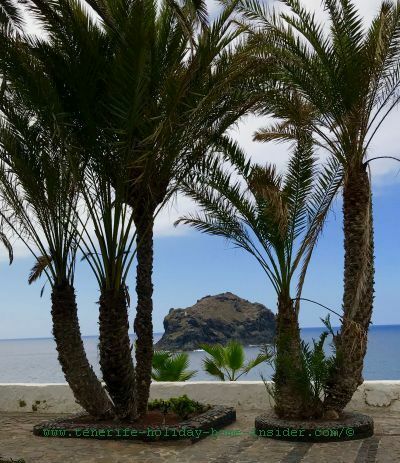 The rock is an icon as well as the origin of the name for its town. It stood all tests of time with a hight of 77m and a 20ha surface. No waves eroded it and no volcano harmed it. Endangered birds shelter in it. 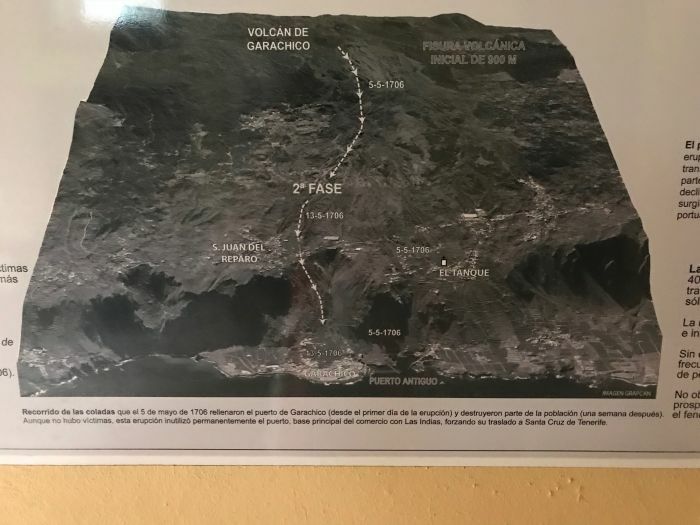 Indeed, the volcanic fury of the Trevejo alias Montañas Negras seemed to discriminate its targets. It didn't only have wondrous ways to achieve what it dit, it also used specific routes. 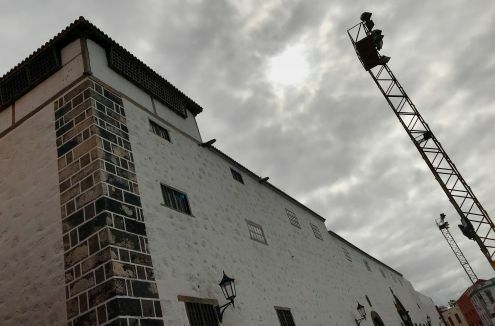 The Hermita de San Roque was totally ignored by the volcano. 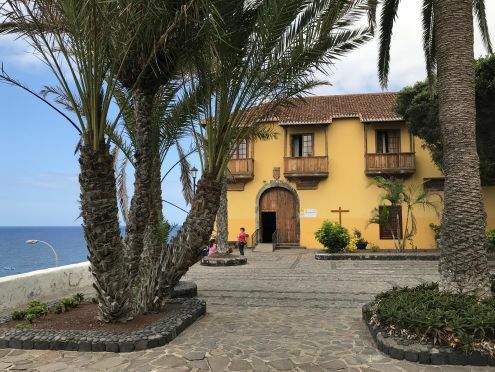 This modest chapel at the Garachico entrance had been built in 1603 to appease the bubonic Pest that had been ongoing since 1601. Rats of a ship had transmitted the disease just like in Santa Cruz de Tenerife. The epidemic also ravaged many other towns of the island. Hence, Garachico was not special in this case. It had terrible floods, fires and monster waves. So did other places. Only the cathastrophy from a fire spitting mountain was nowhere as bad as in Garachico. Casa Marqueses de Villafuerte in Garachico where the depicted Banana plantation belongs to a neighbor. 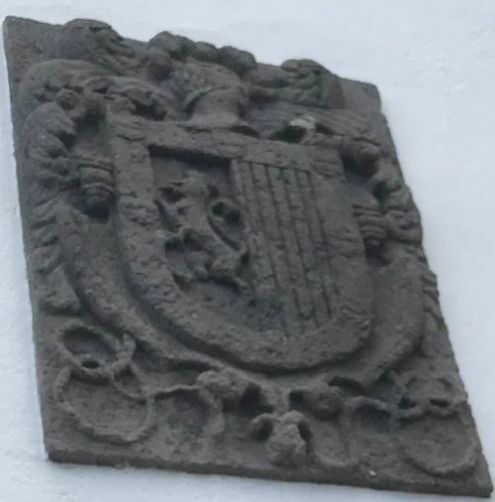 Coat of arms Marquesado Villafuerte worked in stonemasonry and displayed on the wall by a front door. 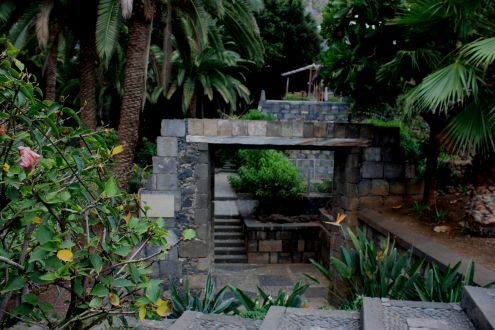 The Casa of the ancestors of the Marchioness de Villafuerte was ignored by the Trevejo. 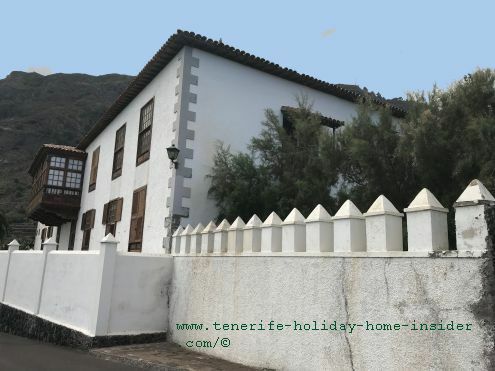 The heirs of this small L-shaped mansion are said to be the only resident aristocrats today in the pretty town of the Isla Baja. 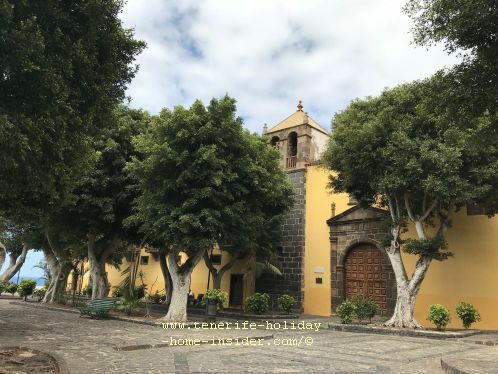 This convent with seven Timber balconies, partial Portuguese architecture and a wonderful belltower church that is used as the town's Autidorium is one of the most beautiful in the Canary Islands. 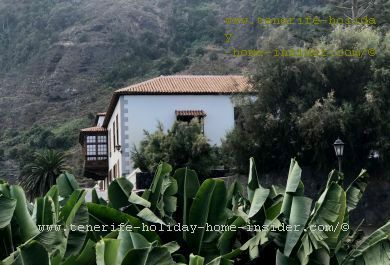 The long cobble street San Roque which runs parallel to the TF42 seems to have some rather ancient but modest houses that start after a stunning corner property. They are likely to have been spared from volcanic destruction. 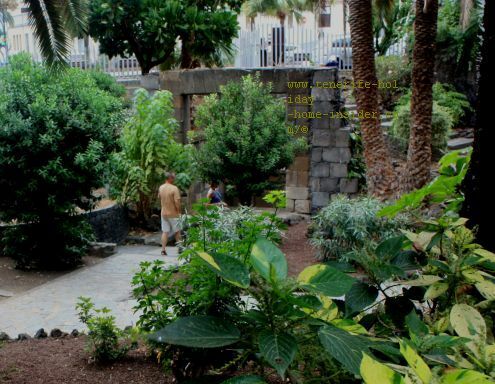 Discover its uncomfortable entrance steps that are overgrown with weeds in Calle Antonio. 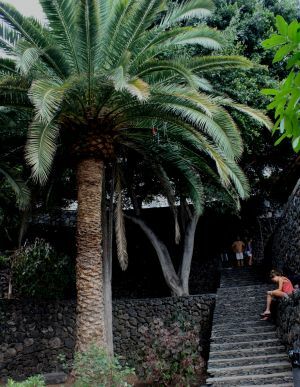 They lead to El Lamero built by Alonso del Hoya between 1600 and 1630. 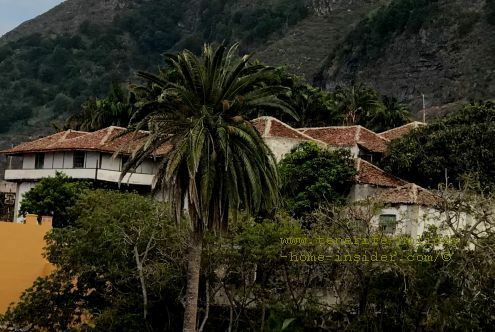 El Lamero Hacienda de Alonso del Hoyo with Spanish clay roof houses that are said to be arranged like a U. 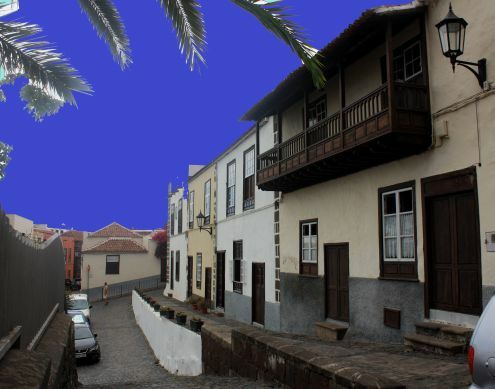 The large estate is seen from further down the road of Calle San Antonio. El Lamero has been privately owned for 20 years. Unfortunately, it's totally cordoned off. Only very minor, volcanic damage there, by the way. The ancient Hacienda is said to have an interesting chapel. One of its many Gofio mills still seem to be intact. 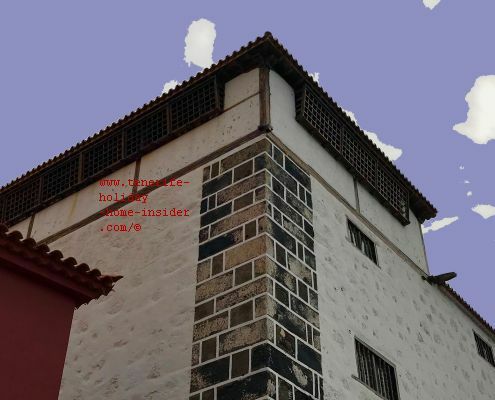 Convent with tower Cloister and Ajinez winged windows high up, as the order must live in strict and total reclusion. 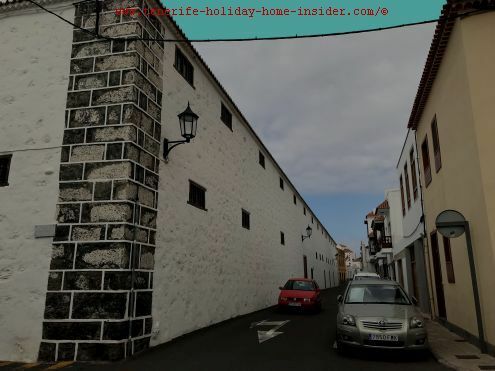 The huge Concepcionista convent, as seen from Calle San Diego, was built by Cristóbal de Ponte from 1637 to 1641. Kloister confinement started in 1643. 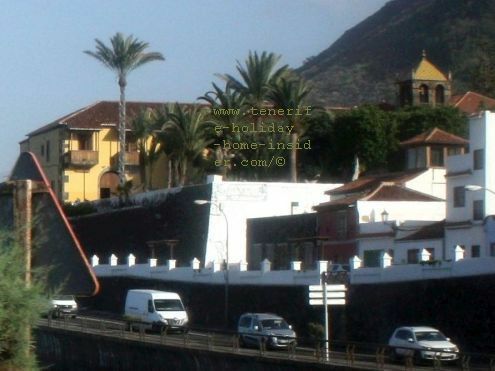 The volcano paid no attention to the gigantic convent of the Concepcionistas. 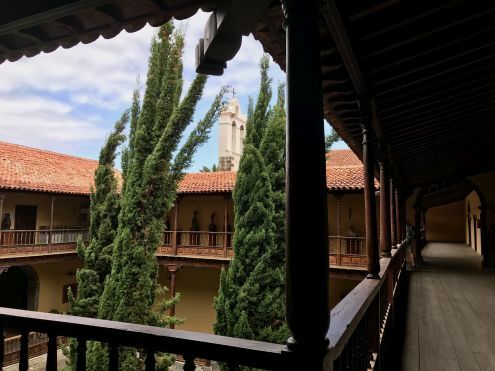 However, they had to leave their Cloister. Why? The suburb San Telmo next to this awesome monastery had been flattended down to the ground by flames caused by burning Lava. 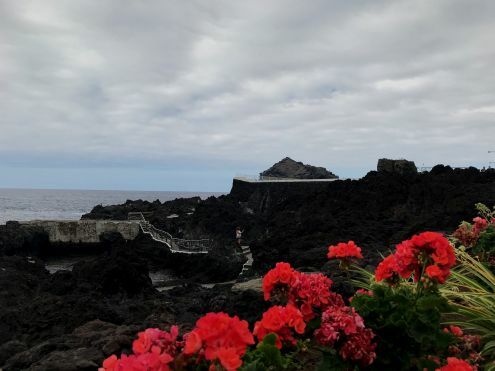 On May fifth of the year 1706 since the afternoon of the volcanic outbreak, Magma pillows of all sizes had continued during phase II to fill up a huge part of Garachico's precious port. At the same time, another Lava flow forked into part of the town next to it. There were no human casualties during the entire time of the Volcano's onslought which arguably may have taken as long as one month. However, the loss of the port proved to be irreparable despite great efforts over many decades. All three phases of the behavior of the Trevejo are pictured there and more. 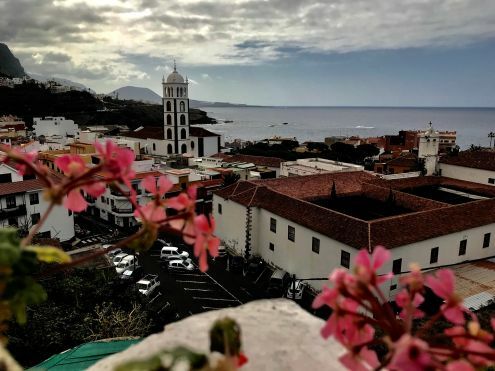 On May 13, an even stronger Lava river wiped out most of the little hamlet of San Juan de Reparo also known as San Juan La Caleta, water channels, Gofio mills, vineyards, crop fields and other parts of the old quarters. Almost ironically, note the surviving remnants of this gateway. This control point that served the port interests of all those who ruled the town is left like a puzzle. It once was very close to the shore of the port, unlike now.Also, Plaza de Juan de la Torre may not have been where it's now. This volcanic monster that rose like a fire spitting sea dragon from the depth of an ocean rift destroyed small and big ships in the harbor, palaces of aristocrats, the mansions of wealthy merchants, damaged the fort Castillo San Miguel by the seaside, the ex-convent of Franciscan monks, its Church of Angels and Iglesia Santa Ana with its art of gold and silver from the Americas. It burned entire warehouses full of wine and sugar, you name it. A marble plastered street vanished, unless it was only a legend.